Article marketing is one of the most effective marketing methods used by Internet Marketers. This pack of PLR articles is written on the Article Marketing niche and you can use these articles on your own blog or website or you can rewrite them and submit them to directories. They are the perfect article set for anyone that has a blog in the IM niche. 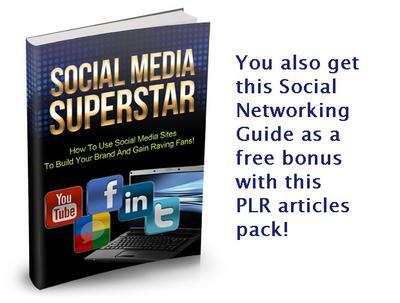 You also get a free bonus of a social networking guide to help you learn how to drive traffic to your articles and blogs – and you can sell it to your list as well!